Evaluate present and forecasted fees and tuition charges for Bluefield State College, in addition to just how these costs contrast to the U.S. average. Prepare yourself money wise for your degree. Contrast Bluefield State College's fees and tuition to other American universities and colleges. Look for price trends and increases to find out whether you should expect to set aside more funds for the following few years of paying for college. How do Fees & Tuition at Bluefield State College Compare to Other Colleges? For nationwide, regional and statewide comparisons, check out the table below to find out how Bluefield State College compares to other colleges. The cost of tuition and fees at Bluefield State College is significantly lowered for residents of West Virginia. Tuition and fees for in-state students is set at $6,728 for the 2017 - 2018 year, a 48.4% discount off the price charged to out-of-state students. Tuition is $6,728 and fees $0. Out-of-state undergrads at Bluefield State College spent $13,032 in tuition and fees in 2017 - 2018. Of this total, $13,032 was the expense of tuition and $0 the price of fees. The subsequent table shows the expenses described above for the 2017 - 2018 academic year. For more info, check out Bluefield State College Part Time Tuition & Fees. Tuition and Fees for out-of-state students attending Bluefield State College increased with a typical yearly rate of 5.0% within the last five years. Over that same period, tuition increased by 5.0% and fees increased by 0.0%. Based on this, we predict the price of tuition and fees this year will be $13,685. At this rate, we estimate the total cost of tuition and fees for a two year degree to be $28,055 and $58,992 for a four-year degree. Remember, this doesn't cover other charges for example room and board, transportation, and books. 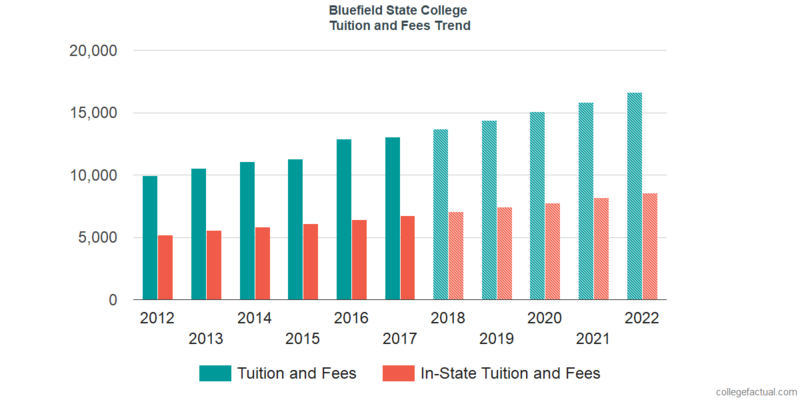 View predicted potential tuition and fees for Bluefield State College students which includes residence based reductions in the following chart. At many colleges you'll wind up paying more in your final year of school than you will in your first. This is due to annual cost growth. It's good to be in the know! Get your finance college questions answered in our tuition & fees FAQ.